Nana Konadu Agyemang-Rawlings, wife of the founder of the governing National Democratic Congress (NDC), Jerry John Rawlings says she pushed the agenda that led to getting the late Madam Hawa Yakubu into parliament. According to the former first lady, despite their political differences, she mobilized women in the Upper West to campaign for Hawa Yakubu several years ago because her husband –Jerry Rawlings had directed her to do so. Nana Konadu who made this known at the maiden edition of the Hawa Yakubu Memorial Lecture at the British Council in Accra on Tuesday said Hawa Yakubu had become an icon in Ghana and Africa because of her capacity and capability in the areas of women empowerment and conflict resolution among others. “He said he knew that the NDC had a candidate there but he asked me to get my women to stop campaigning for the NDC man and go campaign for Hawa Yakubu. I told him that I didn’t know that there were two candidates for us there and he said no not us but it is the woman -Hawa Yakubu- and since you are fighting for women,” she recounted. “That is what we did and we moved all women away from campaigning from the man and they haven’t forgiven me up till today. If we had not been able to push her into parliament, we would not have seen that strength that she had. She may have made it in her constituency maybe but today we are talking about her on the national level. We actually pushed the agenda for her to get into parliament,” she said. Until her death in 2007, Madam Hawa Yakubu was a staunch member of the New Patriotic Party (NPP). 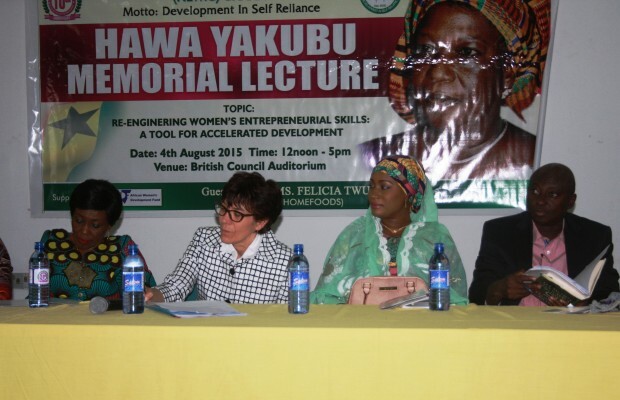 The Hawa Yakubu Memorial Lecture which was meant to celebrate the hard work and contribution of the former Member of Parliament for Bawku Central was in conjunction with the 10th anniversary of Network of Women in Growth (NEWIG), a civil society group that trains women in skill building and developing self-sustaining attitudes in entrepreneurship. Nana Konadu urged lawyers and other stakeholders in society to educate the general public on laws that protect women and children in Ghana which would go a long way to affect change in society. The lecture brought together high profile personalities like Mrs. Samira Bawumia, wife of Dr. Mahamudu Bawumia, running mate of the New Patriotic Party (NPP); H.E. Joanna Adamson, Australian High Commissioner and Lawyer Samuel Atta Akyea, MP for Abuakwa South among others.